There’s a lot to like about Apple’s new MacBook Pro line up of notebooks, but as with any laptop, you are always in the danger of letting all that great design and performance go to waste if you don’t conserve your battery. Especially, if you are not around a power outlet at work or outside. Mophie’s new Powerstation AC is here to change all that as you can charge your MacBook Pro on the go. Mophie is among the big players in the industry when it comes to external power banks and related accessories. The Powerstation AC features a mammoth 22,000mAh battery, which should provide enough oomph to add up to 15 hours of additional battery life to your MacBook Pro. It also sports a 100W AC output with which you can pretty much charge any gadget that you would otherwise need a wall outlet for, including smartphones and cameras. Thanks to external fabric wrap, the Powerstation also looks quite elegant, which is a key consideration for MacBook Pro users, who are used to fantastic-looking products. The wrap makes it scratch-resistant too. But all that comes at a cost. The Mophie Powerstation AC is priced at $199.95. It’s a little steep, but in all fairness, it isn’t as bad as it sounds, given the tremendous capacity. In case you’re not charging through the AC output, you can use the built-in 30W USB-C port with a USB-Power Delivery charging spec, and a USB-A port that offers pass-through power to connected devices. The pass-through power support means the battery pack will recharge itself when connected devices are topped up. The USB-PD label means you can use it to fast charge your iPhone X or iPhone 8; however, you’ll need a separate $25 USB-C lightning cable to do that. Batteries with the flashy “USB-PD” labels are quite expensive, to begin with, so the Powerstation AC is no exception. Coupled with the 100W output, the price seems reasonable. 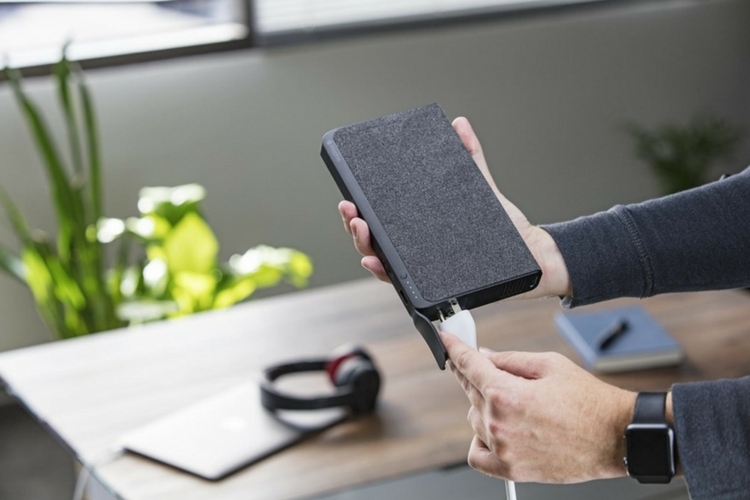 In fact, if you were to buy a similar external battery – or this Battery Case – from the likes of RAVPower, you’ll be shedding at least $130, and it does not boast the full feature set of the Powerstation AC. It is probably not your average everyday external battery pack and but it’s a great choice to go along with your MacBook Pro.